BOTOX FOR FACIAL LINES AND WRINKLES can’t stop the march of time. But what if Botox for certain jaw disorders could relieve patients’ chronic, debilitating pain? Dr. Reda Elgazzar is supervising the first clinical trial in Manitoba in which 25 patients with temporomandibular disorders (TMD) of muscular origin are receiving botulinum toxin (Botox) injections into the chewing muscles of their jaws and temples. “The overwhelming majority have responded very well,” says the associate professor of dental diagnostic and surgical sciences in the Dr. Gerald Niznick College of Dentistry. The study is the master’s project for resident Victor Le [B.Sc. (Dent. )/14, DMD/14] and is funded by a $10,000 research grant from the Canadian Association of Oral and Maxillofacial Surgeons. Although Botox is used “off-label” to treat TMD, Elgazzar explains, it is not yet approved for that use in Canada or the U.S. because more research is needed. The patients participating in the study are powerful teeth grinders or clenchers who haven’t found pain relief from treatments such as analgesics, physiotherapy or wearing a nightguard. The study team will follow up with the patients to measure outcomes such as pain and orofacial function, how wide the patient’s mouth can open, the force of their bite and the bulk of their jaw muscles. 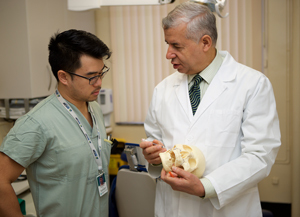 Elgazzar, an oral and maxillofacial surgeon who joined the U of M in 2008, is one of the province’s foremost experts on TMD – disorders of the temporomandibular joint (the medical name for the jaw joint) and the surrounding muscles and tissues. Besides pain in the jaw, head, neck or ears, symptoms of TMD often include clicking, stiffness and locking of the jaw that restrict the ability to chew, speak and move one’s face. What led Elgazzar to focus on the jaw joint, one of the most complex in the human body? When he started practising about 30 years ago in his home country of Egypt, he often had to reconstruct the jaw joints of children. It was common for kids to receive a blow to the chin while playing, he says, but not be taken for medical attention. The result was that the jaw joint fused shut. ‘The surgeon earned his PhD and worked in Scotland, then taught and practised in Egypt and Saudi Arabia before putting down roots in Manitoba. He has a daughter in dental school and a son in medical school at the U of M. He has published research on topics such as dental implants, facial trauma and the reconstruction of jaw joints and bones. Some TMDs can’t be treated with Botox because they are not muscular in origin, but are caused by dysfunction or deterioration of the joint itself. Problems can relate to a small disc of cartilage that acts as a cushion between the joint’s ball and socket. Patients who don’t respond to nonsurgical treatment may undergo arthroscopy, in which a tiny camera is inserted to assess the jaw joint. During this scoping procedure, Elgazzar “washes” the joint and injects a steroid into it to reduce inflammation. The small percentage of patients who don’t get relief may undergo surgery to remove the discs and improve the joints’ mechanical function. Elgazzar supervised a recently published study that compared three diagnostic tools – MRI, arthroscopy, and clinical assessment of signs and symptoms – in about 60 Manitoba TMD patients. The study found that patients’ pain, both before and after arthroscopy, had no meaningful correlation with the position of the discs as seen on MRI. Elgazzar notes that up to 25 per cent of healthy adults have displaced discs, yet experience few or zero symptoms. It’s an example of how TMD pain is not fully understood and requires further research. The professor says the future of TMD treatment may lie in the cutting-edge realm of stem cell science. “In cases of TMD,” he says, “could taking bone-marrow stem cells from the patient’s hip and injecting them into the jaw help to regenerate the affected tissue in the jaw, including cartilage and bone? It’s been tried in other centres, but not in Manitoba.